The 2008 Tall Ships Festival is docking at Victoria's historic Inner Harbour this week. Kicking it off on Thursday, June 26 is the Parade of Sail, with more than two dozen of the world's finest Tall Ships gathering under sail off Victoria and parading into the festival docks. The star of the show will undoubtedly be the HMS Bounty. Famous for her role alongside Marlon Brando in the film Mutiny on the Bounty, she hasn't made an appearance in BC in nearly two decades. 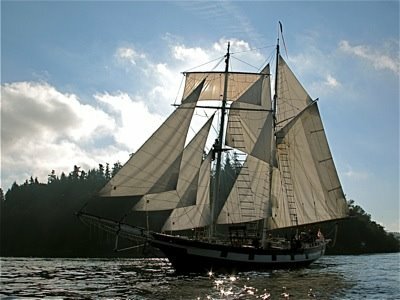 Also sailing to Victoria is Nina, a replica of Christopher Columbus' 15th century vessel during his historic voyage of discovery in 1492. It's said to be the captain's favorite ship, and she not only weathered a hurricane during the voyage but was involved with a clash of pirates off the coast of Italy. Other ships include the brig Lady Washington, featured in Pirates of the Caribbean; HMCS Oriole, the oldest ship in the Canadian Navy; and Hawaiian Chieftain, a replica of a 19th century European merchant trader. Victoria is the first port of call and the only Canadian venue during the 2008 Tall Ships Challenge, a series of races along the west coast of Canada and the US. The four-day festival includes ship tours, a pirate school, sail training activities, music, art, maritime displays, model boat building and nightly mock cannon battles. Go to the Tall Ships website for more details and ticket information.